Sir George Henry Martin CBE was born in Wiltshire, England, in 1926. When he was six years old he developed an affinity for the piano when his parents bought one. He briefly took piano lessons and went on to be self-taught. In World War II George Martin worked as a surveyor and then as a clerk in the War Office. He joined the Fleet Air Arm of the Royal Navy in 1943 and was stationed in England for the duration of the war. In 1947 Martin went on to study oboe and piano at the Guildhall School of Music and Drama. In 1950 Martin got a position working for Parlophone Records. At the time it was a company with a roster of comedy and novelty recordings. In 1955 he became the head of Parlophone while they had success with records by the Goons, Dudley Moore, Rolf Harris, Alan Bennett, Peter Sellers and others. In 1961 Martin produced the British Dance Hall tune “You’re Driving Me Crazy” by the Temperance Seven, that became a #1 hit that year in the UK. Martin was also scoring a number of British films on the side. In 1962 he was interested to discover if Parlophone could capitalize on the rock ‘n roll fad taking hold in Britain. He got introduced to the Beatles manager, Brian Epstein, and decided he had nothing to lose in giving the Fab Four a contract. The Beatles would make one penny for every record sold. After the band released “From Me To You“, Martin arranged for the Beatles to get two pennies for each record sold. 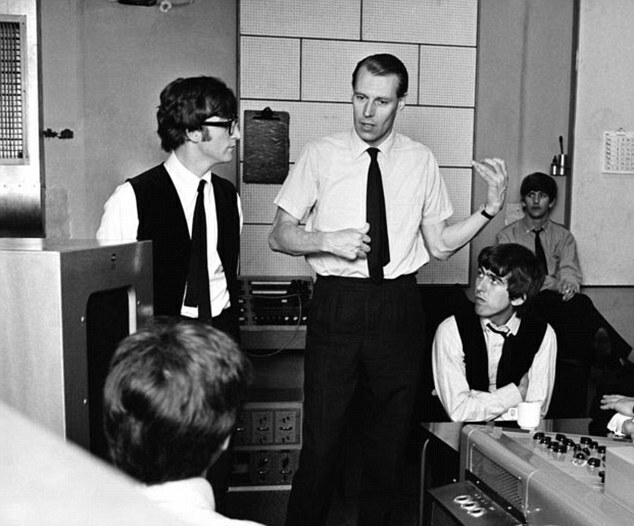 In the studio, George Martin played piano on numbers of tracks for Beatles albums and acted as an arranger and a producer. He played the celesta on the 1963 track “Baby It’s You”. The celesta is a keyboard invented in the 1860s that was a four or five octave instrument, while a piano has seven octaves. In 1964 George Martin arranged and produced the Beatles film, A Hard Day’s Night. For this he won an Academy Award in 1964 in the category of Scoring of Music. In the film George Martin played “Ringo’s Theme”. George Martin’s instrumental peaked at #10 in Vancouver and #53 in the USA. Other local radio markets where the tune did well include San Bernardino, California, (#2), Seattle (#13), Richmond, Virginia, (#8) and Louisville, Kentucky, (#10). 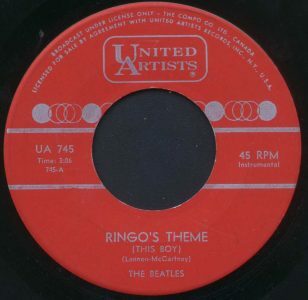 “Ringo’s Theme” is an instrumental version of “This Boy”. It was featured in the film A Hard Day’s Night. It was played during a sequence when Ringo goes for a walk in the streets and along a canal. The reason Ringo has gone off by himself is that while waiting to perform, he was forced to look after Paul’s grandfather. In the granddad’s combative company, Ringo choses to spend some time alone reading a book. Paul’s grandfather convinces Ringo to go outside to experience life rather than reading books. And so Ringo does just that, and this is where “Ringo’s Theme” begins in the film. He goes to the Turks Head Pub in Middlesex to have a drink. But some girls recognize him as Ringo Starr and he leaves the pub. He goes into a clothing store and comes out wearing a trench coat, black hat and a mustache. He walks on, takes some photographs and has an encounter with a ten year-old boy playing hooky from school when a tire the boy is rolling ahead of him down the street bumps into Ringo. They bond briefly when they discover they are both “deserters:” the boy is a truant and Ringo is taking a break from taking care of Paul McCartney’s granddad. At one point Ringo throws some cobble stones into the river and is reprimanded by a cop riding a bicycle. While the rest of the band frantically and unsuccessfully attempts to find Ringo, he is arrested for acting in a suspicious manner. Paul’s grandfather joins Ringo at the police station shortly after attempting to sell photographs wherein he forged the boys’ signatures. Paul’s grandfather eventually makes a run for it and tells the rest of the band of Ringo’s whereabouts. The bandmates go to the station to rescue Ringo but end up running away from the police back to the theatre where they later perform in concert. A Hard Day’s Night was a film in 1964 about Beatlemania. Bound for a London show from Liverpool, The Beatles escape a horde of fans. Once they are aboard the train and trying to relax, various interruptions test their patience: after a dalliance with a female passenger, Paul’s grandfather is confined to the guard’s van and the four lads join him there to keep him company. John Lennon, Paul McCartney, George Harrison, and Ringo Starr play a card game, entertaining some schoolgirls before arriving at their desired destination. Upon arrival in London, the Beatles are driven to a hotel, only to feel trapped inside. They are tasked to answer numerous letters and fan mail in their hotel room but instead they sneak out to party. Paul McCartney has to take care of his grandfather and this becomes a problem at concert rehearsals and elsewhere. 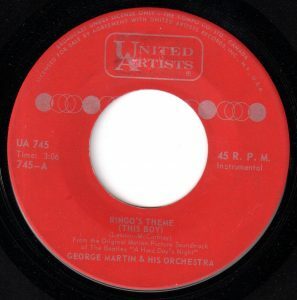 “Ringo’s Theme” is an instrumental version of “This Boy”, that was the B-side to “I Want To Hold Your Hand”. But in Canada “This Boy” was the B-side to “All My Loving”. A rare piece of trivia was passed on to my by local author, Brian Tarling, about the Canadian pressings for “Ringo’s Theme”. An initial pressing made an error when it credited The Beatles for “Ringo’s Theme” and not George Martin. Martin scored the 1966 Beatles film Yellow Submarine. He played the piano solo for “In My Life” and “Lovely Rita”, the harpsichord for “Fixing A Hole”, the steam organ for “Being for the Benefit of Mr. Kite” and arrangements for the strings in “Eleanor Rigby” among other contributions. Martin also scored the music for two James Bond films, Goldfinger and Live and Let Die. In 2006, Martin and his son, Giles Martin, remixed 80 minutes of Beatles music for the Las Vegas stage performance Love, a joint venture between Cirque du Soleil and the Beatles’ Apple Corps Ltd. The term ‘fifth Beatle’ was used initially in the British press once The Beatles became hit makers there in 1963. The phrase was initially used in the press to refer to early bandmates before the group coalesced into Lennon, McCartney, Harrison and Starr. These were bass player Stuart Sutcliffe (1960-62), drummer Pete Best (1960-1962), drummer on several recordings in 1962 ~ Andy White, and Jimmie Nichol who played drums on the first five shows for The Beatles’ 1964 World Tour while Ringo Starr was ill.
George Martin produced the second biggest selling single to date, “Candle In The Wind” by Elton John. The revised lyrics for the song as tribute to Princess Diana after her untimely death resulted in 33 million sales. (“White Christmas” by Bing Crosby, at 50 million sales, is the top selling all time single recording). In the 1980’s Martin also produced the international selling hits “Ebony and Ivory” for Paul McCartney and Stevie Wonder and “Say, Say, Say” for Paul McCartney and Michael Jackson.